"More engagement from behind", the trainer called. So Brenda squeezed her legs and tapped her horse with a whip to make him go fast. And still her trainer wasn't happy. "Not faster, more engaged", she called out. Engaging a horse's hindquarters doesn't mean making him go faster. It means making him drive from behind. 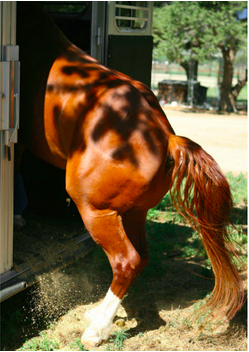 A horse's haunches are the most powerful muscles in his body. They are the engine that must be engaged to drive every gait. Otherwise, your horse will pull himself around by his front feet, his back will hollow, his topline will weaken, and his gaits will lack brilliance. To see the difference, watch these two very brief videos. In the video to the left, a horse who is just starting training trots by essentially pulling herself along on her forehand while her haunches trail along behind. In the video to the right, a more advanced horse trots by pushing from behind. Her trot is energetic, engaged, and connected from back to front. To turn a trot like the one on the left into a trot like the one on the right, engage the horse's hindquarters while keeping an elastic rein contact. (More about how to develop an elastic rein contact here). To engage your horse's hindquarters, you first need to develop a feel for when they are and when they are not engaged. Here are a few simple ways of developing that feel. Have someone longe you at walk, trot, and canter. Your job will be to focus exclusively on what you feel happening behind you. Most of us are so focused on our hands that we often have no idea what's going on behind us. Have your helper drive your horse forward by raising the longe whip, then lower the whip so he relaxes. Do this at each gait, until you are fully aware of what it feels like when your horse is driving from behind. ​If you have not practiced lateral movements, introduce some simple ones. Try a turn on the forehand, with a helper watching. Your helper's job will be to tell you when/if your horse is placing his inside leg underneath his body by crossing it in front of the outside leg. So if you nudge him behind the girth with your left leg, his left hind should cross under his body in front of the right leg. Do this in both directions, and feel how your leg influences your horse's hindquarters--how it moves away from your leg. Then introduce leg yielding. you will need to press your leg behind the girth as your horse's hoof is leaving the ground. That is the only time you can influence his movement. At walk, it is easier to do this if you have a helper tell you when the inside hind is rising. Pay attention to what that feels like. At posting trot, apply your leg when you rise from the saddle. That is when his inside leg is rising. Again, focus on what you are feeling happening back there. Your helper's job is to tell you when your horse's legs are indeed crossing, creating a lateral movement. To assist you, your helper should say "yes" when ever your horse's hind leg crosses under his belly, and "no" when he cheats. You will have more influence if you apply your leg in posting trot when you sit rather than when you rise. But here's the catch: To do that, you will have to post on the wrong diagonal. So if you are tracking clockwise (to the left), you would normally rise from the saddle when the outside foreleg (and inside hind leg) come forward. Instead, you will will to rise when the inside foreleg (and outside hind leg) come forward. Very confusing, yes. This is all much easier if you can sit the trot. ​You can read more about how to leg yield a horse here. Once you have developed a feel for when your horse is engaging his hindquarters and how your leg influences his hindquarters, practice driving him forward by squeezing both legs at walk, trot, and canter at or just behind the girth. You should be able to feel when he is actually pushing from behind after working on these skills on the longe line. You will also notice that it feels as though there is "a lot of horse in front of your legs", almost as though you are sitting on his hindquarters. This is what trainers mean when they say "keep your horse in front of your leg". energetic, forward, and engaged gait.